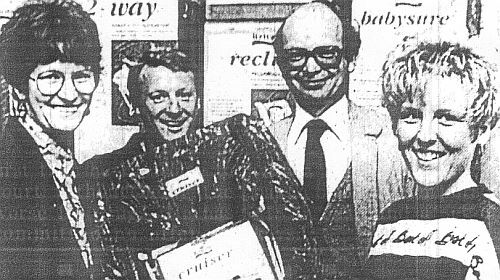 It seemed, in 1991, that every week had news of the poll tax, and there was no doubt that things were being stepped up by the newly formed Lancashire Anti Poll Tax Federation. They pulled off something of a coup when they persuaded the town's Mayor, Councillor Mrs Irene Cooney, to sign a petition calling for an end to poll tax jailings. Mrs Cooney was the first councillor to sign and she said: "They asked me if I was against jailing people for not paying the poll tax. I am, so I signed the petition but I also asked them why they were not lobbying the magistrates because they are the ones who are sending all these people to jail." She also confirmed that the entire Burnley council were very much AGAINST the poll tax. Whilst more were being sent to prison for non-payment of poll tax, there was still no news on an arrest following the murder of 73-year-old Kenneth Howard of Mizpah Street. Police were continuing to follow all leads and were asking for anyone with information to come forward. Meanwhile another Burnley petrol station was targeted. Last time it was Padiham Road and this time it was the station on Casterton Avenue. Police were quick not to link the two. In the first raid it was a masked armed raider but this time the man they were looking for had gone in unmasked and bought a bar of chocolate and a tube of extra strong mints before demanding money. It had all been captured by CCTV cameras. Thieves were most definitely getting cheekier and one poor lady had her handbag snatched in the most remarkable of circumstances. She was worshipping at Sion Baptist Church in Burnley when a man run into the church and snatched it from the pew right by where she was sitting. He made his getaway in a taxi and wasn't traced. The bag had contained bank cards and £25.70 in cash. For one Burnley lady, I believe a lady, it was much better news. It was Mrs Lisa Merrifield who visited a gala day in Barnoldswick, entered a road safety competition and won for herself a child car seat. She was thrilled to bits with the big win, particularly with a baby son Adam at the time. We caught up with her recently and she recalled the big win, even remembering the rather dated looking top she was wearing for the presentation and the 'manufactured' blonde hair. She was no longer aware of the whereabouts of the seat, donated by Jerry Fairburn, another to recall the competition when I spoke to him last week. It was a week of winning and Burnley FC's football in the community scheme held a hugely successful soccer skills course at Gawthorpe, run by community leader Terry Pashley. Burnley youngster Phil Haggerty was the winner at the course. Let's hope he became a 100 percent Claret after such a big success. There was some particularly sad news in local football. Padiham Football Club had reached the semi-final of the Hospital Cup when the devastating news arrived that player and secretary Marc Wilkinson had been killed in a car crash on the M1 near Rotherham. David Byrom hit a hat trick in a 3-0 win against Foxhill in that semi-final which was played on a sad night at Dark Lane, home of Rossendale United, with a minute's silence observed ahead of kick off for the 31-year-old whose stationary vehicle was hit by a truck on the hard shoulder. One Burnley family was celebrating when their 16-year-old son was called up to play for Northern Ireland against Poland at youth level. 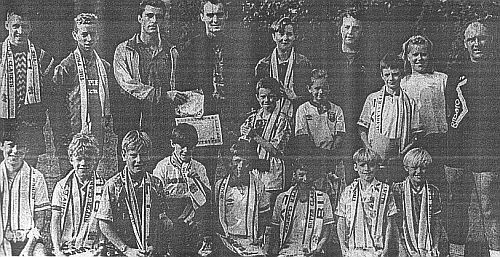 Jonathan Irvine was, at the time, an apprentice at Blackpool and this was his first call up. He qualified for the Northern Ireland side through his dad Willie (who is apparently from Northern Ireland) and dad travelled to Belfast with Blackpool manager Billy Ayre to watch the game. Well done Chuck. A young Burnley player was doing well too. We'd beaten Oldham 2-1 in the Lancashire Youth Cup with goals from John Mullin and substitute Chris Brass and Graham Wood on behalf of Oldham had some positive things to say about our team, and one player in particular. He said: "John Mullin is the best young player I have seen since Trevor Steven was a youngster at Turf Moor. Burnley deserved to beat us and their future looks good if these youngsters develop as they should." As for the first team, it was the first match in the post-Casper era and caretaker boss Mullen had selection problems. Mike Conroy was still ruled out with a groin injury and David Hamilton hadn't recovered from the back injury sustained at Hereford. That Hereford defeat also saw us without John Francis again because of the alleged elbow incident. He'd been sent off and was given a three match suspension. This was the second of those matches. Better news was that Graham Lancashire was fit after recovering from a head injury, that was not accidental, at Scarborough and Steve Harper was able to play with a light cast on his arm. We were ready. As one era drew to a close another began. Jimmy Mullen, Casper's assistant, wasn't everybody's idea of the ideal candidate. He never doubted he was made of the right stuff and began his caretaker stint intent on proving it and quickly. Burnley were certainly not back to their best, not by any means, but they were too good for a very poor Carlisle United side who were as bad as anything we'd played so far in the season. Mullen switched to a 4-4-2 system, dispensing with the extra defender and it helped the Clarets with the returning Harper much more suited to his forward role. He, and Lancashire, were the stand out players for the Clarets. 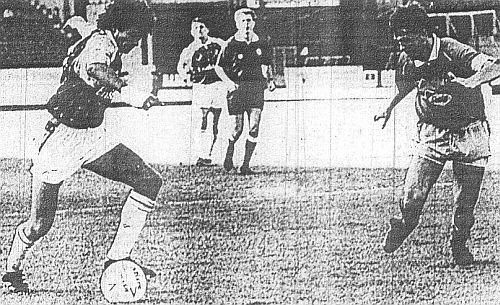 But when Burnley took the lead midway through the first half it was captain John Pender who was in the right place as he turned attacker to head in his first goal for the club. We won a corner on the left hand side at the cricket field end and PENDER was first to the ball to head into the roof of the net. A defender got a head to it on the line but he couldn't prevent it going in. That we had to wait until 12 minutes into the second half for the second goal was a surprise, as was the fact that it took almost that long for Carlisle to be reduced to ten men. Simon Jeffels was booked in the first half and was fortunate to last until the 55th minute when he left referee John Kirby with no option when he fouled Lancashire after the ball had gone. Two minutes later, Burnley got the second goal their play had deserved. Harper and Deary combined down the right with Harper crossing the ball. It was knocked beyond the far post where Pender kept it in play, played it back across and after a deflection off Andy Barnsley it fell nicely for LANCASHIRE to make it two goals in two games. There could have been more goals but Burnley had to settle for a 2-0 win and the new man in charge was full of praise at the final whistle. He said: "I am pleased for everyone at Burnley Football Club. It has been a hell of a week for everyone. "It was always going to be a very hard game. I don't care what anyone says about Carlisle being second bottom, the circumstances of the last three or four days meant that it had to be tough. "The players were brilliant. They rose to the occasion and did everything I asked of them and for everyone connected with the club, and I mean everyone. Everyone at Burnley Football Club has had a kick in the teeth this week. Frank Casper was a very, very respected person around the place. "All I said to the players was 'Go out and remember what we have said to you since the start of the season'. They gave of their best and got the points." Mullen also confirmed that the decision to change formation and to revert to man-to man marking was not made after Casper's departure. He added: "On paper this always looked like a game where we should play 4-4-2. "Frank and I had decided earlier in the week to change the system and I had been working on it in training since Monday. "Last week I thought two of the goals were down to players passing on the responsibility to someone else. Man-to-man marking means there is no spare man at the back and I thought John Pender and Steve Davis handled things perfectly." The result didn't lift Burnley in the table and we remained in 11th place following this win with a trip to Wrexham to come a week later. 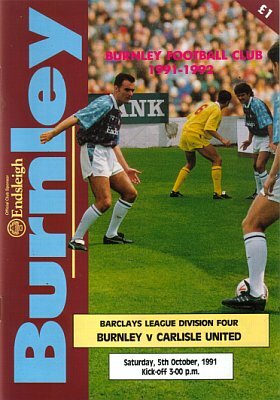 Burnley: Andy Marriott, Ian Measham, Ian Bray, Steve Davis, John Pender, Andy Farrell, Steve Harper, John Deary, Graham Lancashire (Danny Sonner 70), Joe Jakub (Mark Yates 73), Roger Eli. Carlisle United: Kelham O'Hanlon, Andy Barnsley, Tony Gallimore, David Miller, Simon Jeffels, Mike Graham, Gwyn Thomas (Tony Lowery 61), Andy Watson, Tony Fyfe (Dean Walling 61), Darren Edmondson, Paul Proudlock. Cardiff City won the Welsh battle with the biggest win of the week, beating Wrexham 5-0 and leapfrogging them in the table. Chris Pike scored a hat trick for Cardiff. None of the top four won, but the point gained by Blackpool at Northampton Town was enough to take them clear at the top of the league, one point ahead of Mansfield Town, Hereford United and Barnet. York City proved to be the biggest climbers. They kicked off the day in 21st place but their 4-1 home win against Maidstone United lifted them seven places to 14th.